AURORA | Despite opposition by about half of the state’s elected sheriffs and some rank-and-file police, including those in Aurora, the state legislature approved a controversial “red-flag” gun control bill Thursday, making it closer to becoming law. 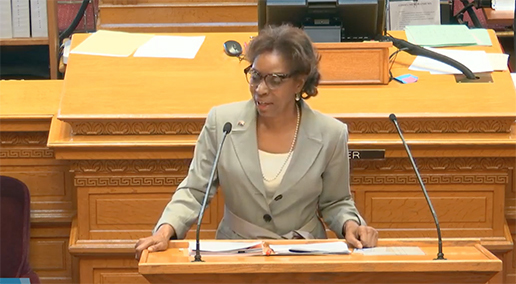 Aurora Democratic State Sen. Rhonda Fields spoke yesterday before the Senate vote, countering opposition about the measure’s lack of due process. The so-called “red flag bill” designed to temporarily remove firearms from persons deemed by a court to be a risk to themselves or others. House Bill 19-1177 passed on final reading in the state Senate on a 18-17 party line vote. Democratic Senate President Leroy Garcia controversially voted against the bill, the only Democrat in the state Senate to do so. Flying in the face of Aurora Police Department brass and the City Council, the Aurora police union on Thursday announced it opposition to the measure. In a Facebook post published around 9 a.m. on Thursday, the Aurora Police Association wrote it is joining the Denver police union in condemning the bill, which would allow family members and law enforcement officials to petition courts to strip weapons from people deemed to be a threat to themselves or others. Centennial state Rep. Tom Sullivan, who’s son Alex died in the theater shooting, is the bill’s primary sponsor. The union for the Denver Police Department, the Denver Police Protective Association, formalized its opposition to the so-called red flag measure in a press release issued Wednesday.